6.5 L of extracellular fluid, of which only about half is in the fetus, placenta, and amniotic fluid. The remainder is distributed between maternal vascular and interstitial fluid compartments at a ratio of about 1:3. The increase in sodium retention over the course of gestation is remarkable when pregnancy-induced changes in renal hemodynamics are also considered. Resistance of the renal vasculature declines to a greater extent than the decrease in total peripheral vascular resistance discussed previously. It may be recalled that the afferent and efferent glomerular arterioles are the major sites of resistance to blood flow in the kidneys (see Chapter 24). Decreased resistance in these vessels results in a greater than 50% increase in effective renal plasma flow (ERPF). 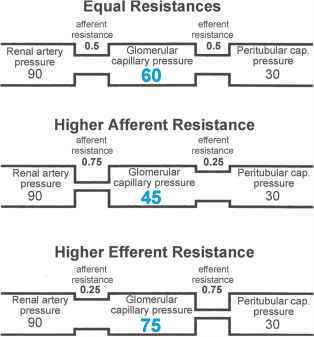 Glomerular capillary pressure changes little from the nonpregnant state because resistance is reduced in both the afferent and the efferent glomerular arterioles. Increased flow through the glomerular capillaries at constant hydrostatic pressure and decreased colloid osmotic pressure results in a greater than 50% increase in the glomerular filtration rate (GFR) (see Chapter 24). Consequently, the filtered load of sodium increases from about 20,000 to about 30,000 mEq/day, and reabsorptive mechanisms of the renal tubules are therefore faced with an additional load of 10,000 mEq of sodium just to maintain sodium balance. Their task is made even more difficult by the natriuretic effects of high concentrations of progesterone, which, at high concentrations, may compete for binding to the mineralocorti-coid receptor. Nevertheless, a net retention of sodium averaging 3 to 5 mEq of sodium per day between the 8th and 20th weeks must take place to account for the expansion of plasma volume. The hormone directly responsible for sodium retention is aldosterone (see Chapters 29 and 40), the concentrations of which increase steadily in plasma throughout pregnancy to levels that are far above those seen in nonpregnant women (Fig. 6). Although nonpregnant individuals escape from the sodium-retaining effects of prolonged elevations in aldosterone concentration (see Chapter 40), increased sodium retention is sustained throughout pregnancy. Angiotensin II is the principal stimulus for aldosterone secretion. Its production depends upon secretion of renin by the juxtaglomerular cells of the kidney (Chapters 27 and 40) and the availability of its precursor, angiotensinogen. Hepatic secretion of angiotensinogen is stimulated by high circulating concentrations of estrogens. Increases in angiotensino-gen concentration lead to increases in angiotensin formation over the range of physiologically relevant concentrations of renin. In men and nonpregnant women, the effective blood volume is the regulated variable in the control of renin secretion. 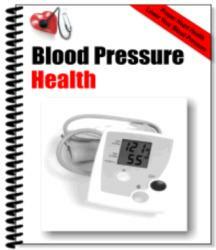 Changes in blood volume are sensed by stretch receptors in the walls of great veins in the chest, the atria, and the carotid sinuses, by pressure or stretch receptors in the afferent glomerular arterioles, and by sodium chloride receptors in the maculae densae of the renal tubules (see Chapter 29). It seems paradoxical that renin secretion continues to increase throughout pregnancy despite sustained and increasing expansion of vascular volume and the increased delivery of sodium chloride to the distal tubules that results from the increase in GFR. It is possible that decreased stimulation of pressure receptors due to the decrease in arterial pressure and the increase in compliance of the thoracic vasculature is interpreted by the vasomotor center as a decrease in vascular volume. The physiological response to such an interpretation is increased sympathetic stimulation of the renin-secreting juxtaglomerular cells. Alternatively, hormones of pregnancy may decrease the sensitivity of these stretch receptors or act directly at the hypothalamic level to adjust the set-point for volume regulation. In any event, secretion of renin by the kidneys during pregnancy is not autonomous and is adjusted upward or downward by the same physiological control mechanisms that are operative in nonpregnant women (Fig. 7). For example, the decrease in central venous volume that occurs upon rising from a recumbent to a standing position causes renin secretion to increase in pregnant as well as non-pregnant women. Similarly, renin levels decline after sodium loading and increase upon sodium deprivation whether or not the test subject is pregnant. Thus, the renin/angiotensin system continues to regulate vascular volume throughout pregnancy, but at a higher set-point.